My 9 year old bought this guitar with her christmas money last year. She has been taking lessons for 9 months now and it has been a wonderful guitar. One review said you get what you pay for and I feel we have gotten decent instrument that has recieved a few nicks and scrapes as she learns to care for her instrument. In a a year or two we will replace it with a larger size and a step up in quality. 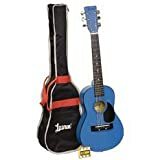 I highly reccommend this guitar for a child/ family that is new to music. Great value for a child instrument. This is a nice sounding guitar. Although it comes with a pitch pipe, there are no instructions on how to use it or even which pipe should tune which string. If I hadn’t already had some musical background, I would still be at a loss on tuning it. However, the guitar seems pretty well constructed (I’ve seen worse) and the color really got my child excited to play it. I would recommend buying some type of teaching tool when you purchase the instrument because it doesn’t come with anything. We were not pleased with this guitar at all. Yes, you get what you pay for, and it’s by all means not an expensive guitar, but even for what we paid, we expected it to be of some quality. It sounded as “tinny” as you can think. In fact, my son wanted to keep it so he could play “banjo” with it. I told him we’d buy him a banjo if he really wanted to play. The fret board was scratchy looking among many other flaws in workmanship.